Born in a disc of gas and rubble, planets eventually come together as larger and larger pieces of dust and rock stick together. They may be hundreds of light-years away from us, but astronomers can nevertheless watch these planets as they form. 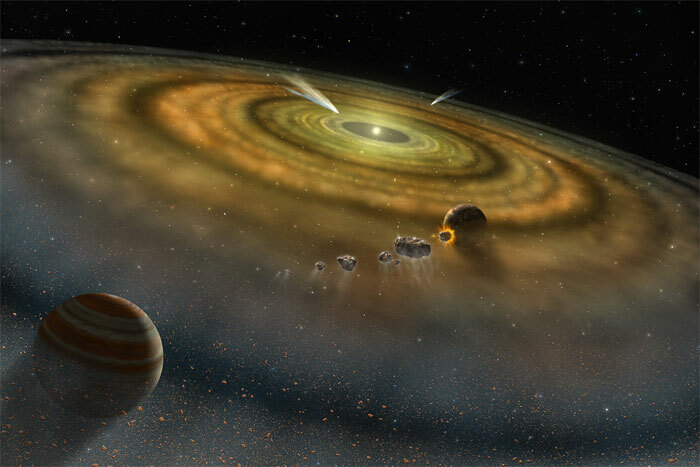 One major point of interest is the chemistry of the rubble that forms around a star before a planetary system is formed, known as the protoplanetary disc. The gas molecules that float in the disc could eventually become part of the atmosphere of the planets. If these molecules contain oxygen or nitrogen, the odds increase of a life-friendly planet forming. "It's very interesting to think about the molecular composition (of these discs)," said Catherine Walsh, an astronomer at Leiden Observatory in the Netherlands. "The molecules that are in those discs will make up the molecules in planetary atmospheres, and planetesimals such as comets." Walsh led a new study, "Complex organic molecules in protoplanetary disks," which was published in February 2014 in the journal Astronomy and Astrophysics. In the study, the astronomers modeled how complex molecules form in protoplanetary systems with the hopes of better understanding their observations. Molecules in protoplanetary discs emit their light in the millimeter and sub-millimeter frequencies of light, which are between the observation ranges of radio telescopes and infrared telescopes. Until recently, however, there have been few observatories devoted to this particular band of light with the necessary capabilities to see complex molecules. "There has been a lot of work done to date, mainly with single-dish submillimeter telescopes," Walsh said. While any observation is helpful, the single dish meant that astronomers could not get the high spatial resolution and sensitivity that they need to see more complex molecules. This changed in 2013, however, when the Atacama Large Millimeter Array (ALMA) in Chile lighted up for the first time. The observatory — described as the largest astronomical project that exists right now — will eventually include 66 antennas located at 5,000 meters altitude, which puts it above much of the section of the atmosphere that blocks millimeter light from arriving at the surface. "This is really the next big thing in molecular astrophysics, and ALMA will give us orders of magnitude (of improvement) in sensitivity," Walsh said. Although her team has submitted a proposal to examine molecules using the giant array, the popularity of the telescope (which brings many competing proposals) means she is not sure if they will succeed. If they do manage to get a slot of time, the astronomers will have to work quickly to publish their results. "One great benefit is all of the ALMA data will be publicly available after one year. We will end up having this huge archive. Anyone can access the data and publish science with that data," Walsh said. Complex molecules are considered "precursors" of prebiotic chemistry, or the chemistry that gives rise to the conditions needed for life. A famous example of prebiotic chemistry took place in 1952, when scientists Stanley Miller and Harold C. Urey put the gas forms of methane, hydrogen, ammonia and water vapor into a sealed container, then struck the gas with electricity (an analog of lightning). After doing this for a week, the walls of the container contained an organic sludge that included several of the amino acids that life uses today. The question, Walsh said, is which complex molecules are present in protoplanetary discs, and would ALMA be able to see them? Complex molecules are not only potential precursors of life, but the ices in which they are thought to form also acts as a coagulant for dust grains to stick together and form planets. Her team's paper modeled the environment around T Tauri type stars, the phase that a young star goes through before turning into a star like our own Sun. Unlike stars that are older, the light that is emitted from these objects comes from gravitational contractions as the star draws material in from the surrounding disc. Walsh's team used calculations to generate a model of the disc, focusing on the temperature, density, structure and the strength of ultraviolet light. They then used this model to compute the chemistry. With this information in hand, they ran another set of calculations to predict what ALMA would be able to see. Molecules are visible from afar because their rotation produces distinctive spectra, or line emissions that can be seen from Earth. The model predicted formaldehyde, a molecule with four atoms in it, which was a good thing because the results confirmed what has been detected in previous observations of protoplanetary discs. However, astronomers would like to find a more complex molecule like methanol, a derivative of methane, which on Earth is naturally produced by bacteria. In space, methanol is formed slightly differently: it is a derivative of carbon monoxide. Methanol hasn't been seen yet in protoplanetary discs. The more complex a molecule is, the less bright its spectrum appears in telescopes, making it harder to spot. Yet, Walsh said she's nevertheless sure that the ALMA telescope would be up to the task of spotting methanol, a “first rung on the ladder of complexity,” and that could lead to the discovery of even more complex molecules, containing both oxygen and nitrogen. If methanol is spotted, a next step would be to see where it occurs and study how it forms. In all likelihood, the molecule would form on the surface of dust grains because complex molecules are thought to have inefficient gas-phase routes to formation because of the low gas densities in space. The next research step is to find glycine — the simplest amino acid and a building block for proteins — in protoplanetary discs. Walsh characterized glycine as "the holy grail" of research, and noted its "prebiotic significance” as one of the building blocks of life. But could ALMA detect glycine? "I like to err on the cautious side,” she said. “It's possibly beyond the capabilities of the telescope." But then again, it's hard to predict what sort of technology will be available in the future, she added. One possibility is the Square Kilometer Array, a set of radio telescopes under construction in both Australia and South Africa, so named because the collecting area would be about a square kilometer (0.4 miles) in size. Construction of the telescope is scheduled to begin in 2018 and be finished by the mid-2020s. The array will pick up a set of complex molecules with longer wavelengths and lower frequencies than ALMA. "It's possible we can see more prebiotic molecules with something like the Square Kilometer Array," she added. Learning more about these complex molecules will also teach us about the ingredients which are available during the planet formation process, which will help astronomers understand how the molecular composition of the Earth, and the other Solar System planets, came to be, Walsh said. "We've now seen thousands of exoplanets and we know that planet formation is ubiquitous,” she said. “We now know there are many more planets in the universe than stars, and there are a lot of stars (to research). There is so much to be done in (researching) this (protoplanetary) phase."